Gage Haught, who had been in surgery to remove his appendix just a couple of hours before Superhero Training Camp, colors his superhero mask. Behind him, Isabelle Bahr, who was preparing to go home, models her mask and cape with theater teacher Sarah Bailey. 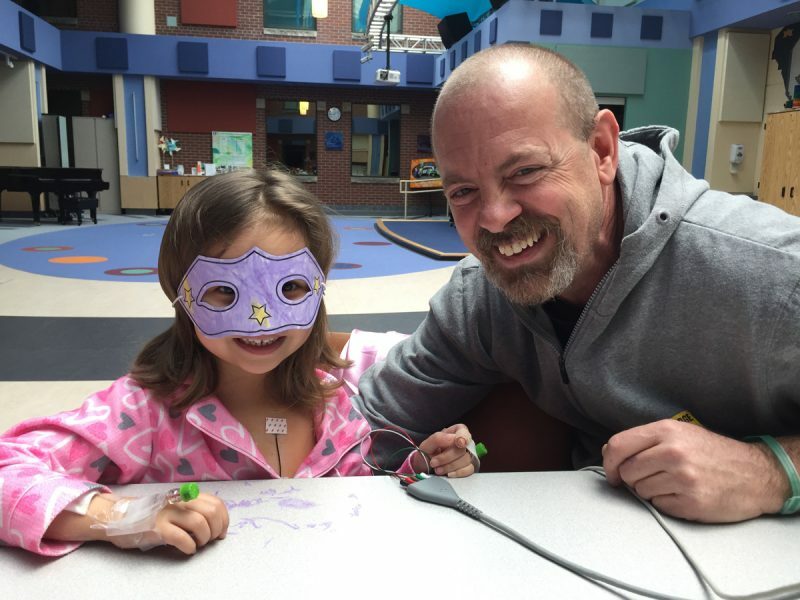 We know our patients are superheroes, but sometimes they need a little help discovering that on their own. 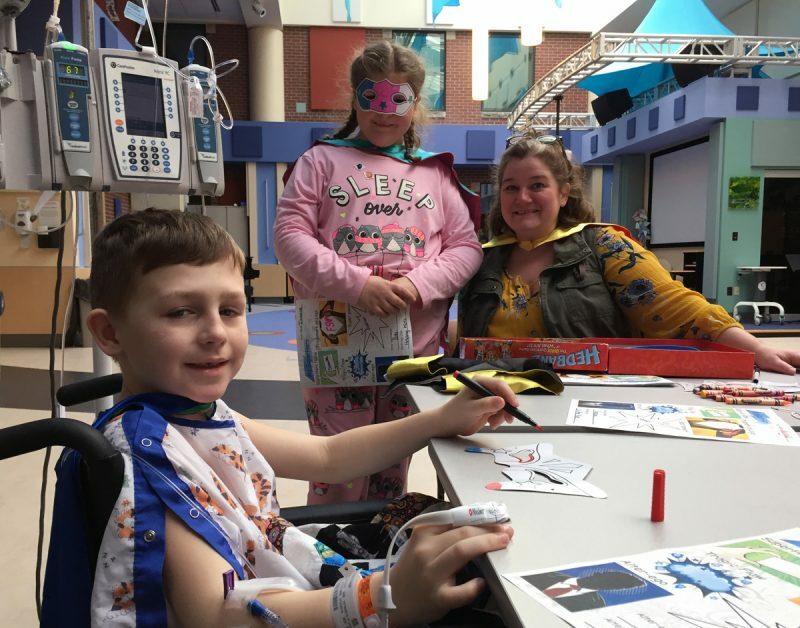 During their hospital stays, several kids recently got to brush up on their skills at Superhero Training Camp, a program at the Emily Cooper Welty Expressive Therapy Center. 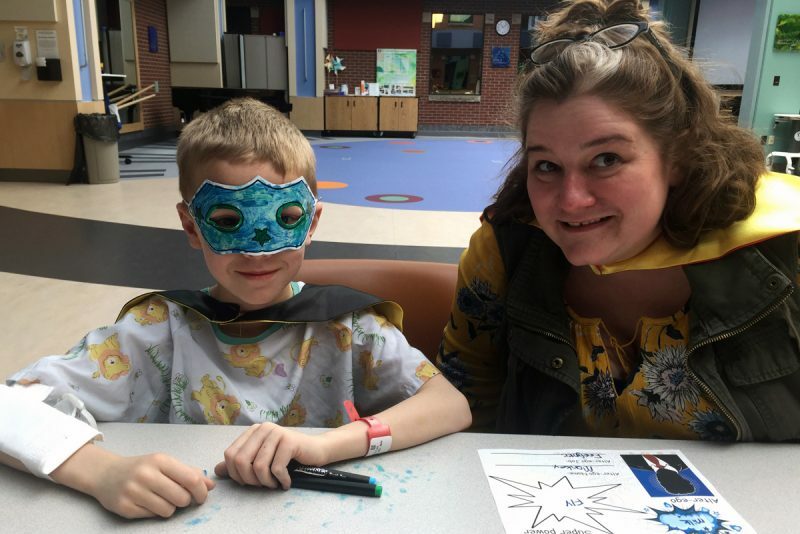 Led by theater arts teacher Sarah Bailey, of Rubber City Theatre, the crash course included mask making, cape wearing and alias creating as well as practice in using the power of deduction. Gage practices using his powers of deduction during a game of Hedbanz as mom Super Shelly gives him a hand. For Gage Haught, 7, the experience helped him decide on his superhero name: The Gagenator. He also declared his special power would be his ability to be “super fast.” His parents, Shelly and Adam Haught, joined in the fun and adopted their own superhero monikers of Super Shelly and A-Train. Jaeya Leonard, 4, who attended the camp just 2 days after surgery to repair a hole in her heart, settled on Princess Jaeya as her superhero name and flying like a butterfly as her special skill. She played along in a game of Hedbanz with the help of her grandfather, Dan Adams, aka Super Papa, who noted his super power is making Jaeya smile. Jaeya Leonard beams when she tries on her superhero mask and cape as Super Papa aka grandfather Dan Adams looks on. Bailey said she visits the Expressive Therapy Center monthly with a rotating slate of theater enrichment programs. She’s been doing it for 4 years, and all costs are paid through a grant she received from the Emily List Fund for Performing Arts Therapy. 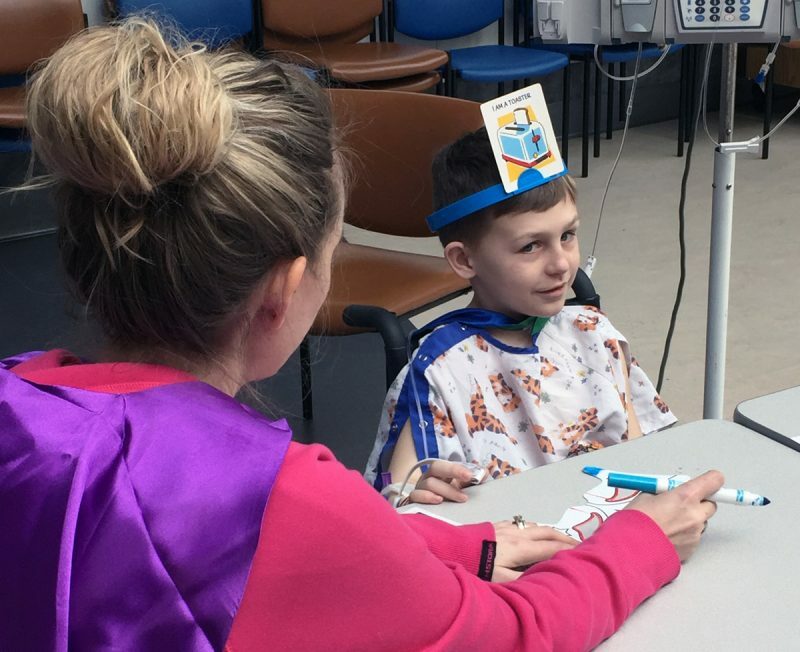 Previous programs have included princess and pirate themes, but the superhero day was one that especially resonated with the patients and caregivers who stopped by. Ben Laser, also known as Super Ben, shown with theater teacher Sarah Bailey, shows off his superhero mask. “I keep telling her she’s a superhero,” said Jaeya’s mom, Alyssa Adams. The Expressive Therapy Center, located on the 6th floor, provides holistic healing through the use of creative arts such as imagery, storytelling, dance, music, drama, poetry and visual arts. Programs are open to current patients and their families at no cost.